Myofascial pain is a common syndrome seen by family practitioners worldwide. It can affect up to 10% of the adult population and can account for acute and chronic pain complaints. In this clinical narrative review we have attempted to introduce dry needling, a relatively new method for the management of musculoskeletal pain, to the general medical community. Different methods of dry needling, its effectiveness, and physiologic and adverse effects are discussed. Dry needling is a treatment modality that is minimally invasive, cheap, easy to learn with appropriate training, and carries a low risk. Its effectiveness has been confirmed in numerous studies and 2 comprehensive systematic reviews. The deep method of dry needling has been shown to be more effective than the superficial one for the treatment of pain associated with myofascial trigger points. However, over areas with potential risk of significant adverse events, such as lungs and large blood vessels, we suggest using the superficial technique, which has also been shown to be effective, albeit to a lesser extent. Additional studies are needed to evaluate the effectiveness of dry needling. There also is a great need for further investigation into the development of pain at myofascial trigger points. Numerous noninvasive methods—such as stretching, massage, ischemic compression, laser therapy, heat, acupressure, ultrasound, transcutaneous electrical nerve stimulation, biofeedback, and pharmacological treatments—have been used to alleviate chronic myofascial pain, but no single strategy has proved to be universally successful.9,10 Another way to treat myofascial pain is by dry needling (intramuscular stimulation, Western acupuncture, medical acupuncture), which is a minimally invasive procedure in which an acupuncture needle is inserted directly into an MTrP. Although an acupuncture needle is used, the therapy is based on the traditional reasoning of Western medicine. The sites for needle insertion are located in skeletal muscles taught in any basic anatomy course. Dry needling is easy to learn, and a basic course usually lasts 2 to 4 days. The aim of this review is to introduce dry needling, a relatively new treatment modality used by physicians and physical therapists worldwide as a part of complex treatment of chronic musculoskeletal pain, to the wide audience of family physicians, rheumatologists, orthopedic surgeons, physiatrists, pain specialists, dentists, and physical therapists. For family physicians and other health care providers who are interested in a deeper understanding of myofascial pain, MTrPs, and methods of their management, we recommend the “classical” textbooks: Travell and Simons's1 Myofascial Pain and Dysfunction: The Trigger Point Manual; The Gunn Approach to the Treatment of Chronic Pain15; and Baldry's22 Acupuncture, Trigger Points, and Musculoskeletal Pain. Examples of dry needling application are shown in Figure 1. Examples of dry needling applications. A: Marking out the quadratus lumborum muscle before needling. B: Needling the paraspinal muscles. Effectiveness of dry needling in the management of MTrPs has been evaluated in numerous RCTs and 3 comprehensive systematic reviews.10,23,24 Cummings and White, 10 in their systematic review of 23 RCTs of needling therapies (dry needling or injections), stated that direct needling of MTrPs seems to be an effective treatment, but the hypothesis that needling therapies have efficacy beyond placebo is neither supported nor refuted by the evidence from clinical trials. Any effect of these therapies is probably because of the needle or placebo rather than the injection of either saline or active drug. The most recent systematic review included 7 RCTs of acupuncture and dry needling for the management of MTrPs.24 Evidence from one study suggested that direct MTrP needling was effective in reducing pain compared with no intervention. Two studies provided contradictory results when comparing direct needling of MTrPs versus needling elsewhere in muscle; the evidence from another 4 studies failed to show that needling directly into an MTrP is superior to various nonpenetrating sham interventions. Tough and colleagues24 mentioned significant methodological limitations of original studies included in the review. Firstly, although MTrPs seem to have been identified carefully in most studies, it is not clear that they were the sole cause of pain. Secondly, sample sizes were generally small, which raises the possibility of type II error, where the likelihood of a study producing a false-negative result is increased.25 Thirdly, treatment interventions varied considerably in the location of needle placement, the depth of insertion, individual treatment times, and overall number of treatment sessions. Until evidence of the possible mechanism of action of needling is available, or until different interventions have been compared directly, there is no logical basis for choosing the optimal intervention. Finally, the recent Cochrane systematic review of 35 RCTs23 assessed the efficacy of acupuncture and dry needling for management of low back pain. It was concluded that there is evidence of pain relief and functional improvement of chronic low back pain with the use of acupuncture compared with no treatment or sham therapy. These effects were only observed immediately after the end of the sessions and at short-term follow-up. One paper, published by Gunn et al26 approximately 30 years ago, showed that, in a long-term follow-up RCT of 56 patients treated at the Workers’ Compensation Board, the group that had been treated with needling was found to be clearly and significantly better than the control group (P > .005). There was evidence that acupuncture in conjunction with other conventional therapies relieves pain and improves function better than the conventional therapies alone. However, the treatment effects were small. Dry needling seemed to be a useful adjunct to other therapies for chronic low back pain. Furlan and colleagues23 also mentioned the low methodologic quality of original studies. We agree with Cummings and White's10 conclusion that because marked improvements occurred among patients who were treated with needling, further research is required to investigate whether needling of MTrPs has an effect beyond placebo, with emphasis on the use of an adequate control for the needle. In the early 1980s, Baldry22 suggested inserting the needle superficially into the tissue immediately overlying the MTrP. He called this technique “superficial dry needling” and applied it to MTrPs throughout the body with good empirical results, even in the treatment of MTrPs in deeper muscles. Baldry22 recommended inserting an acupuncture needle into the tissues overlying each MTrP to a depth of 5 to 10 mm for 30 seconds. Because the needle does not necessarily reach the MTrP, local twitch responses are not expected. Nevertheless, the patient commonly experiences an immediate decrease in sensitivity after the needling procedure. If there is any residual pain, the needle is reinserted for another 2 to 3 minutes. Baldry27 advocates the use of superficial dry needling over deep dry needling because the procedure is very easy to carry out; in contrast to deep dry needling it is a painless procedure (other than an initial short, sharp prick); there is minimal risk of damage to nerves, blood vessels, and other structures; and there is a low incidence of soreness after treatment. We found only 2 small studies that evaluated the effectiveness of superficial dry needling. Edwards and Knowles28 conducted a single-blind, prospective RCT in which participants received either superficial dry needling combined with active stretching exercises, stretching exercises alone, or no treatments. After 6 weeks, the superficial dry needling group had significantly less pain compared with the no-intervention group and significantly higher pressure threshold measures compared with the active stretching-only group. In a single-blind placebo-controlled trial of 17 participants with chronic lumbar MTrPs, Macdonald et al29 found that superficial dry needling was significantly better than the placebo in reducing pain. Several studies have compared superficial to deep dry needling. Naslund and colleagues30 compared the effect of deep versus superficial needling (which they considered to be placebo) in a group of 58 individuals with idiopathic anterior knee pain. The authors found no statistical difference between the 2 methods. Pain measurements decreased significantly in both groups and remained low at both 3 and 6 months. Ceccherelli et al31 compared the therapeutic effects of superficial and deep dry needling in a prospective, double-blind RCT of 42 patients with lumbar myofascial pain. In the first group, the needle was inserted into the skin above the MTrP to a depth of 2 mm; the second group received intramuscular needling (approximately 1.5 cm) at 4 arbitrarily selected MTrPs. There was no difference between the groups at the end of the treatment but, after 3 months, the deep dry needling technique resulted in significantly better analgesia than the superficial dry needling technique. In another RCT, the efficacy of standard acupuncture, superficial dry needling, and deep dry needling was compared in the treatment of elderly patients with chronic low back pain.32 The standard acupuncture group received treatment at traditional acupuncture points, with the needles inserted into the muscle to a depth of 20 mm. The dry needling group received treatment at MTrPs in the quadratus lumborum, iliopsoas, piriformis, and gluteus maximus muscles, among others. In the superficial dry needling group, the needles were inserted into the skin over MTrPs to a depth of approximately 3 mm. There were 2 treatment periods (4 weeks each), with a 3-week interval between them. At the end of the study, the group that received deep needling to MTrPs reported less pain intensity and improved quality of life compared with the standard acupuncture group or the superficial needling group, but the differences were not statistically significant. In discussion of the results Ceccherelli et al31 suggested that muscular afferents are more important for the transmission of acupuncture analgesic signals than the skin afferents. They supported this theory by citing Chiang's et al33 observation that the blockade of nervous afferent fibers from the skin did not eliminate the acupuncture analgesia, whereas the anesthetic blockade in deep tissues did eliminate acupuncture analgesia. Itoh et al32 noted that MTrPs are supposed to be sites where nociceptors, such as polymodal-type receptors, have been sensitized by various factors. The polymodal-type receptors are also proposed as possible candidates for acupuncture and moxibustion because they respond to chemical, thermal, and mechanical stimulation, all of which can generate an analgesic effect.34 Results of the 2 last studies suggest that acupuncture stimulation of MTrPs in muscle may produce greater activation of sensitized polymodal-type receptors, resulting in stronger effects on pain relief. However, the polymodal receptors are distributed in the skin as well as the fascia and muscle, and the possibility that superficial needling may activate polymodal receptors in the skin and produce analgesic effects should not be excluded. Additional and more well-designed studies are needed to evaluate the effectiveness of superficial dry needling. In the meantime we suggest the use of this method in “dangerous” areas, such as above the lungs and great vessels. According to Gunn's15 approach, needling should be performed not only at the site of pain but also in the paraspinal muscles of the same spinal segment that innervates the painful muscles. In a single-blinded RCT, Ga and colleagues35 compared the efficacies of dry needling of MTrPs with and without paraspinal needling in 40 elderly patients with myofascial pain syndrome. Eighteen patients received 3 weekly sessions of dry needling treatment of the upper trapezius MTrP, and 22 patients received similar treatment with additional paraspinal needling. At 4-week follow-up, the group that had received paraspinal dry needling had more continuous subjective pain reduction than the group that received dry needling alone; the paraspinal dry needling group saw significant improvements of ratings on the geriatric depression scale, but the group who received dry needling alone did not; the paraspinal dry needling group saw improvements of in the cervical range of motions but the group that received dry needling alone did not see improvements in extensional cervical range of motion. The authors suggested that paraspinal dry needling is a better method than MTrP dry needling alone for treating myofascial pain syndrome in elderly patients. This study was relatively small, included only an elderly population, and used insufficient blinding procedures. The results must therefore be confirmed in additional studies before paraspinal needling can be routinely recommended in addition to MTrP needling. Several adverse effects associated specifically with dry needling have been reported. These include soreness after needling, 35 local hemorrhages at the needling site, 35 and syncopal responses.36 Adverse effects of acupuncture, which are similar to those of dry needling, have been well described.37,38 In a recent prospective observational study of 229, 230 patients who received, on average, 10.2 ± 3.0 acupuncture treatments from 13, 679 German physicians who had received acupuncture training, 37 8.6% of patients reported experiencing at least one adverse effect, and 2.2% reported one that required treatment. Common adverse effects were bleedings or hematoma (6.1% of patients, 58% of all adverse effects), pain (1.7%), and vegetative symptoms (0.7%). Two patients experienced a pneumothorax (one needed hospital treatment, the other only required observation). In a British study of acupuncture performed by physicians and physical therapists, 38 no serious adverse effects were reported and the frequency of minor adverse effects occurred in 671 per 10, 000 acupuncture sessions, including 14 per 10, 000 events that were considered to be “significant.” All “significant” adverse events had cleared up within 1 week, except for one incident of pain that lasted 2 weeks and one of sensory symptoms that lasted several weeks. Considering these results, we can conclude that dry needling/acupuncture provided by physicians and physical therapists is a very safe treatment. Dry needling is a relatively new treatment modality used by physicians and physical therapists worldwide. It is minimally invasive, cheap, easy to learn, and carries a low risk. Its effectiveness has been confirmed in numerous studies and 2 comprehensive systematic reviews. Dry needling can be used as part of complex treatment for chronic musculoskeletal pain and can be applied by family physicians, rheumatologists, orthopedic surgeons, physiatrists, pain specialists, dentists, and physical therapists. The deep method of dry needling has been shown to be more effective than the superficial one for the treatment of pain associated with MTrPs. Therefore, we suggest that it be used as the method of choice. However, above areas with potential risk of significant adverse events, such as lungs and large blood vessels, we suggest using the superficial technique, which has also been shown to be effective, albeit to a lesser extent. Additional studies are needed to evaluate the effectiveness of superficial dry needling and to confirm the study that found that paraspinal needling in addition to MTrP needling is more effective than MTrP needling alone. There is also a great need for further investigation into the etiology of MTrP pain development. Received for publication December 24, 2009. Revision received March 25, 2010. Accepted for publication March 29, 2010. Simons DG, Travell JG, Simons LS. Travell and Simons’ myofascial pain and dysfunction: the trigger point manual. Volume 1, 2nd ed. Baltimore, MD: Williams & Wilkins; 1999. Fishbain DA, Goldberg M, Meagher BR, Steele R, Rosomoff H. Male and female chronic pain patients categorized by DSM-III psychiatric diagnostic criteria. Pain 1986; 26: 181–97. Fricton JR, Kroening R, Haley D, Siegert R. Myofascial pain syndrome of the head and neck: a review of clinical characteristics of 164 patients. Oral Surg Oral Med Oral Pathol 1985; 60: 615–23. Skootsky SA, Jaeger B, Oye RK. Prevalence of myofascial pain in general internal medicine practice. West J Med 1989; 151: 157–60. Gerwin RD. A study of 96 subjects examined both for fibromyalgia and myofascial pain [abstract]. J Musculoskelet Pain 1995; 3(Supl 1): 121. Feinberg BI, Feinberg RA. Persistent pain after total knee arthroplasty: treatment with manual therapy and trigger point injections. J Musculoskelet Pain 1998; 6: 85–95. Ingber RS. 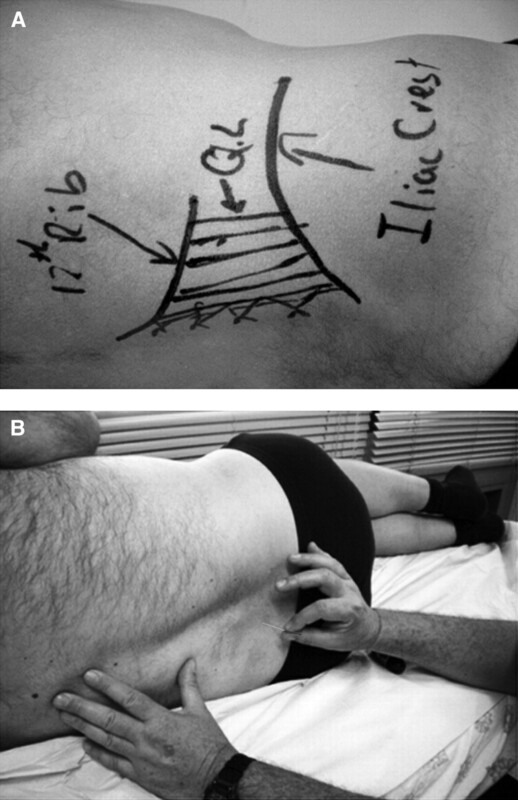 Iliopsoas myofascial dysfunction: a treatable cause of “failed” low back syndrome. Arch Phys Med Rehabil 1989; 70: 382–6. Tay A, Chua K, Chan K-F. Upper quarter myofascial pain syndrome in Singapore: Characteristics and treatment. J Musculoskelet Pain 2000; 8: 49–56. Borg-Stein J, Simons DG. Focused review: myofascial pain. Arch Phys Med Rehabil 2002; 83: S40–7, S48–9. Lewit K. The needle effect in the relief of myofascial pain. Pain 1979; 6: 83–90. Ga H, Choi JH, Park CH, Yoon HJ. Acupuncture needling versus lidocaine injection of trigger points in myofascial pain syndrome in elderly patients–a randomised trial. Acupunct Med 2007; 25: 130–6. Barbagli P, Bollettin R, Ceccherelli F. [Acupuncture (dry needle) versus neural therapy (local anesthesia) in the treatment of benign back pain. Immediate and long-term results]. Minerva Med 2003; 94: 17–25. Hong CZ. Lidocaine injection versus dry needling to myofascial trigger point. The importance of the local twitch response. Am J Phys Med Rehabil 1994; 73: 256–63. Gunn CC. The Gunn approach to the treatment of chronic pain. 2nd Ed. New York: Churchill Livingstone; 1997. Gunn CC. Radiculopathic pain: diagnosis, treatment of segmental irritation or sensitization. J Musculoskelet Pain 1997; 5: 119–34. Cannon WB, Rosenblueth A. The supersensitivity of denervated structures: a law of denervation. New York, NY: MacMillan; 1949. Travell J, Rinzler S, Herman M. Pain and disability of the shoulder and arm: treatment by intramuscular infiltration with procaine hydrochloride. JAMA 1942; 120: 417–22. Chen JT, Chung KC, Hou CR, Kuan TS, Chen SM, Hong CZ. Inhibitory effect of dry needling on the spontaneous electrical activity recorded from myofascial trigger spots of rabbit skeletal muscle. Am J Phys Med Rehabil 2001; 80: 729–35. Lu G-D, Needham J. Celestial lancets: a history and rationale of acupuncture and moxa. Cambridge, UK: Cambridge University Press; 1980. Hong CZ. Myofascial trigger points: pathophysiology and correlation with acupuncture points. Acupunct Med 2000; 18: 41–7. Baldry PE. Acupuncture, trigger points and musculoskeletal pain. Edinburgh, UK: Churchill Livingstone; 2005. Furlan AD, van Tulder MW, et al. Acupuncture and dry-needling for low back pain. Cochrane Database Syst Rev 2005;(1):CD001351. Tough EA, White AR, Cummings TM, Richards SH, Campbell JL. Acupuncture and dry needling in the management of myofascial trigger point pain: a systematic review and meta-analysis of randomised controlled trials. Eur J Pain 2009; 13: 3–10. Sim J, Wright C. Research in health care. Concepts, designs and methods. Cheltenham, UK: Stanley Thornes, Ltd.; 2000. Gunn CC, Milbrandt WE, Little AS, Mason KE. Dry needling of muscle motor points for chronic low-back pain: a randomized clinical trial with long-term follow-up. Spine (Phila Pa 1976) 1980; 5: 279–91. Baldry P. Superficial dry needling at myofascial trigger point sites. J Musculoskelet Pain 1995; 3: 117–26. Edwards J, Knowles N. Superficial dry needling and active stretching in the treatment of myofascial pain–a randomised controlled trial. Acupunct Med 2003; 21: 80–6. Macdonald AJ, Macrae KD, Master BR, Rubin AP. Superficial acupuncture in the relief of chronic low back pain. Ann R Coll Surg Engl 1983; 65: 44–6. Naslund J, Naslund UB, Odenbring S, Lundeberg T. Sensory stimulation (acupuncture) for the treatment of idiopathic anterior knee pain. J Rehabil Med 2002; 34: 231–8. Ceccherelli F, Rigoni MT, Gagliardi G, Ruzzante L. Comparison of superficial and deep acupuncture in the treatment of lumbar myofascial pain: a double-blind randomized controlled study. Clin J Pain 2002; 18: 149–53. Itoh K, Katsumi Y, Kitakoji H. Trigger point acupuncture treatment of chronic low back pain in elderly patients–a blinded RCT. Acupunct Med 2004; 22: 170–7. Chiang CY, Chang CT, Chu H, Yang L. Peripheral afferent pathway for acupuncture analgesia. Scientia Sinica 1973; 16: 210–7. Kawakita K. Polymodal receptor hypothesis on the peripheral mechanisms of acupuncture and moxibustion. Am J Acupunct 1993; 21: 331–8. Ga H, Choi JH, Park CH, Yoon HJ. Dry needling of trigger points with and without paraspinal needling in myofascial pain syndromes in elderly patients. J Altern Complement Med 2007; 13: 617–24. Huguenin L, Brukner PD, McCrory P, Smith P, Wajswelner H, Bennell K. Effect of dry needling of gluteal muscles on straight leg raise: a randomised, placebo controlled, double blind trial. Br J Sports Med 2005; 39: 84–90. Witt CM, Pach D, Brinkhaus B, et al. Safety of acupuncture: results of a prospective observational study with 229,230 patients and introduction of a medical information and consent form. Forsch Komplementmed 2009; 16: 91–7. White A, Hayhoe S, Hart A, Ernst E. Adverse events following acupuncture: prospective survey of 32 000 consultations with doctors and physiotherapists. BMJ 2001; 323: 485–6. KinetaCore. Physical Therapy Education. Available at http://www.gemtinfo.com. Accessed 15 July 2010. Yun-Tao M. Dry needling course. Available at http://www.dryneedlingcourse.com. Accessed 15 July 2010.